We can write our own template files if we follow the same package structure and file names. Then when we run the GroovyDoc tool we must make sure our custom template files are used instead of the default ones. If we place our custom files in the class path of the GroovyDoc tool before the Groovy library then our custom files are used. In our Gradle project we can create a new source set that will contain our custom template files. Then we configure the classpath property of the groovydoc task and prepend it with the output of our source set. This way we can override the default implementation. Let's change the classDocName.html template. We make a directory src/groovydoc. Here we create the directories org/codehaus/groovy/tools/groovy/gstringTemplates/classLevel. Inside the directory we create the file classDocName.html. 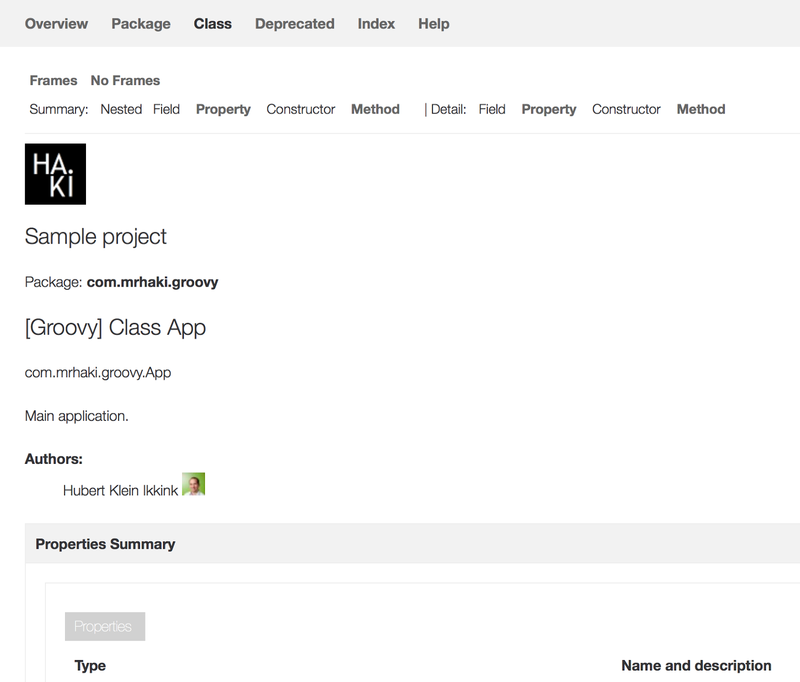 We use the contents from the default classDocName.html found in the Groovy library and make some small changes. We want to add a Gravatar image to the Authors section. In our source code we must use the @author tag and include the e-mail address of the user between square brackets. For example @author Hubert Klein Ikkink [actual-email-address]. In our template file we will look for the value between the square brackets and replace it with a <img/> HTML tag referencing the Gravatar image. To make CSS changes we add the file stylesheet.css in the directory src/groovydoc/org/codehaus/groovy/tools/groovy/gstringTemplates/topLevel. Also here we can use the file from the Groovy library as starting point and make changes in it. // we want to override for our project. // added by the Groovy plugin. // Set document and window titles. windowTitle = "Example customizing GroovyDoc"
// in the changed classDocName.html file. // Set custom footer for generated documentation. // the output of the SourceSet groovydoc. // before the files that are bundled with Groovy. Notice we have our custom header, the Gravatar image and custom CSS.